Ghazal singer Jagjit Singh, who is turning 70 Feb 8 next year, has grand plans for his birthday - he will celebrate the whole year by performing and releasing albums. "I am not free for any playback singing next whole year. I am celebrating my 70th birthday whole year by performing at 70 concerts and releasing seven albums that will have 70 songs," said Singh at the music launch of "Shahrukh Bola Khoobsurat Hai Tu" at Novotel Hotel here Tuesday. 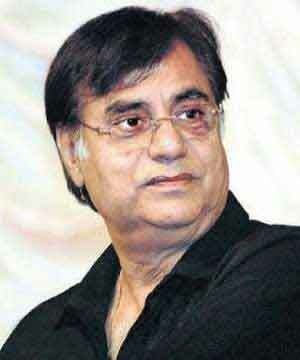 Jagjit has lent his voice to two songs in the film and sang one of them - "Bhool jaana use dafnna dena" - at the event. "Shahrukh Bola Khoobsurat Hai Tu" is actor Makrand Deshpande's first Hindi directorial venture. The veteran theatre actor had earlier directed Marathi films "Danav" (2003) and "Hanan" (2004). Releasing Nov 19, "Shahrukh Bola Khoobsurat Hai Tu" is a romantic movie that revolves around a roadside flower girl whose life changes when her dream hero (Shah Rukh Khan) praises her looks while passing by a traffic signal where she was selling flowers.